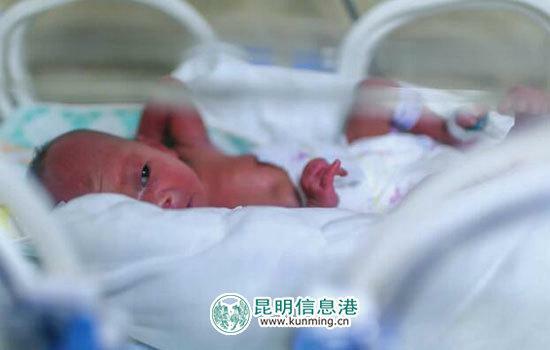 A 41-year-old mentally-retarded woman, diagnosed with terminal gastric cancer 30 weeks after she becoming pregnant, has given birth to a baby girl, Kunming.cn reported on Wednesday. Ma Fengzhen comes from Jijie Village, Xundian County of Yunnan Province. She vomited incessantly and was extremely weak after being diagnosed as pregnant. On March 9, her family members took her to the Yan'an Hospital of Kunming City where a lump was found in her stomach that proved to be diagnosed with terminal gastric cancer. Further examinations showed Ma also suffered from a severe electrolyte disorder and malnutrition. She weighed only 32 kilograms – a figure which shocked all the doctors and nurses in the obstetrics department. "I have never seen such a skinny pregnant woman in the 30 years of my medical career," said Dr. Niu Zhaoyi, director of the obstetrics department. Dr. Niu immediately suggested an abortion as a continued pregnancy could endanger her life. However, Ma and her family didn't agree. "Ma's husband is already aged 45, and is very eager to have a child," said her elder sister. The hospital then adopted careful surgical treatment procedures for Ma. A "green emergency channel for critically-ill pregnant women" started operating immediately. On March 13, a baby girl was delivered eight weeks premature by caesarean section, weighing 1.56 kilograms. The newborn baby is receiving special medical care in an incubator. While everybody heaved a sigh of relief for the baby's birth,the high medical cost for Ma's chemotherapy treatment and her baby's medical care is troubling the poor family. Life is really hard for Ma with one trouble after another. She was born mentally retarded and cannot take good care of herself. She married three times and has a 16-year-old daughter by her first husband. In Ma's first two marriages, she suffered severe domestic violence. Her ex-husband even hit her on the head with a stick. Ma's present husband is a kind and simple man, but is utterly destitute. So far, Ma's family hasn't paid any medical expense for the surgery, medicine and hospitalization. Dr. Niu said the hospital would do everything possible to lighten the poor family's load. A 41-year-old mentally-retarded woman, diagnosed with terminal gastric cancer 30 weeks after she became pregnant, has given birth to a baby girl.